This robust Sheng Puer Tuocha from Zhen Kang County in Yunnan Province possesses a unique floral aroma and a rich, deep flavor without bitterness. 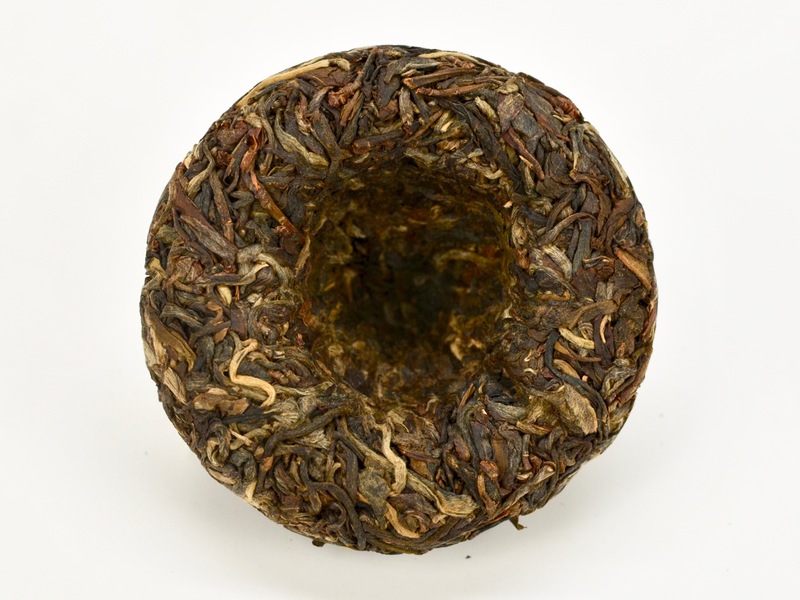 This Little Sheng Tuocha comes from Feng Wei Tuan Mountain in Zhen Kang County, Yunnan Province. The tallest mountain peak in Feng Wei Tuan reaches 2865m, and the mountain range has a long tea growing history. However, in recent years, the Silver War along the border of Myanmar has made this border region inaccessible for our Tea Tours in 2016 and 2017. This sparsely populated, mountainous region is home to many old tea trees growing in the forest. Tea trees in this region are distinguished by their very thick and soft leaves. They possess a unique floral aroma and a rich, deep flavor without bitterness. When sipping this tea, you may feel an initial shock of astringency to your palate, but it just as soon fades into sweetness. The young leaves used to make this Little Sheng Tuocha were plucked in the spring of 2014 at a rather young plucking standard of 1 bud and 1-2 open leaves. Once harvested, the fresh leaves are fried, kneaded into a twisted shape, and naturally dried. The resulting loose maocha tea is then weighed out into batches of 100g, steamed, and compressed into a traditional melon-shaped tuocha cake. This cake is fairly small and not particularly thick. The leaves are compressed tightly enough to hold together on their own. These small cakes are well suited to aging. However, this cake is also good for immediate drinking to enjoy the rich flavor and light floral aroma. This tea is an excellent choice for those seeking a the robust flavor of a traditional sheng puer without bitterness. Sheng puer like this is very popular in China for soothing the respiratory system. Brewing Guidelines: Use 3/4 Tbs leaves (or use a hard tool to break off a quarter-sized piece) per 20 oz water. Use boiling (212°F) water, first infusion at least 1 min. Infusions: The leaves are good for at least 6 infusions.